Craft die from Impression Obsession featuring a large cake. This is a single die measuring 2-1/2 x 3 inches. 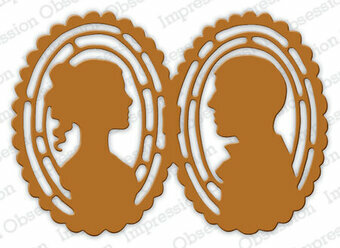 Love themed Impression Obsession die featuring silhouettes of a man and a woman. US-made steel die compatible with most table-top die cutting machines. This is a single die measuring approximately 3 x 4 inches. The light strand is 1/2" x 5-3/4" and the lights are 1/4" x 3/8" and 3/8" x 5/8". These dies are compatible with most tabletop die cut machines. This is a set of 3 dies measuring 1 3/8" in diameter. Features the sentiments "For You", "Thank You", and "Enjoy". These are US-made steel dies compatible with most table-top die cutting machines. The large frame is 4" in diameter and the inner opening is 3". The small frame is 2-7/8" outside diameter and the inner opening is 2". This die is compatible with most tabletop die cut machines. Additional shims may be necessary and some machines handle the detail level better than others. This is a set of 4 dies. The pot is 2-1/8" x 2-1/2", the grinder is 1-3/4" x 2", the cup is 1-1/8" x 1-1/2", and the beans are 1/4" x 3/8". These are US-made steel dies compatible with most table-top die cutting machines. Craft die featuring cupcakes. This is a set of 19 dies. 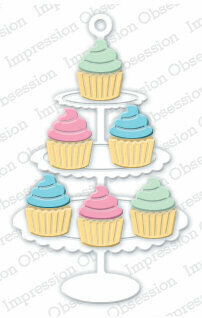 There are parts to cut out 6 cupcake that measure 5/8 x 1 inch and the stand measures 2-1/2 x 4. These dies are compatible with most tabletop die cut machines. Craft die from Impression Obsession featuring a corner filled with flowers. This is a single die measuring 3 x 3 inches. Craft die from Impression Obsession featuring a Dog Bookmark. This is a single die measuring 2 x 4 inches. These are US-made steel dies compatible with most table-top die cutting machines. Impression Obsession die featuring the word "Love". These dies are compatible with most tabletop die cut machines. This is a single die measuring .625 x 5.5 inches. Craft die from Impression Obsession featuring Elegant Feathers. This is a set of 3 dies. The longest feather is approximately 1-3/8 x 4 inches, the smallest is 1 x 2 inches, and the medium sized one is 1-1/2 x 3 inches. These are US-made steel dies compatible with most table-top die cutting machines. Craft die from Impression Obsession featuring Autumn leaves. This is a set of 16 dies. The largest leaf is approximately 1-3/4 and the smallest is around 1 inch. These are US-made steel dies compatible with most table-top die cutting machines. This is a set of three separate dies wired together, they can be separated by snipping the wires. The ornament measures 2-1/2" and the bow is 1-1/2" wide. These dies are compatible with most tabletop die cut machines. Additional shims may be necessary and some machines handle the detail level better than others. This is a set of two separate dies wired together, they can be separated by snipping the wires. The trees measure 1.5" x 3.5.". These dies are compatible with most tabletop die cut machines. Additional shims may be necessary and some machines handle the detail level better than others. This is a set of three separate dies wired together, they can be separated by snipping the wires. The largest bird feather is 1.375 x 3.875 inches, the medium one is 1 x 2.875 inches, and the smallest one is 1.25 x 2 inches. Designed by Dina Kowal, dkdesigns. These dies are compatible with most tabletop die cut machines. Impression Obsession die featuring a heart with flourish. US-made steel die compatible with most table-top die cutting machines. This is a single die measuring approximately 3-3/8 x 4 inches. Impression Obsession craft dies featuring flowers, "For You", "Thanks a Bunch", "Just Because", and "Hello Spring". These are US-made steel dies compatible with most table-top die cutting machines. Craft die featuring leaves. This is a set of 4 dies. They measure from 2-1/4 x 2-1/4 inches down to 5/8 x 1 inch. These dies are compatible with most tabletop die cut machines. Craft die featuring trees in a forest. This die measures 4 x 5 inches. These dies are compatible with most tabletop die cut machines. Craft die featuring a flower. This is a set of 4 dies. The finished flower measures 2-1/2 inches in diameter. These dies are compatible with most tabletop die cut machines. Craft die from Impression Obsession featuring 2 corners. This is a set of 2 dies both measuring 1-1/2 x 1-1/2 inches. This is a set of 2 dies. The slits are positioned to cut a holder for a standard size gift card and the "Enjoy" is a cutout die measuring 1-1/4" x 2-3/8". These are US-made steel dies compatible with most table-top die cutting machines. Craft die from Impression Obsession featuring a Christmas Card. This is a set of 2 dies. The gift card pocket is approximately 5 x 5-7/8 inches, and the three reindeer measure 1-1/4 x 2-1/2 inches. These are US-made steel dies compatible with most table-top die cutting machines. Christmas themed Impression Obsession craft die featuring gingerbread houses. This is a set of 7 dies. These are US-made steel dies compatible with most table-top die cutting machines. This is a single die measuring 2 x 3-1/8 inches. This is a single die measuring 2-3/4 x 3-3/4 inches. Features the sentiment "Sending Lots Of Good Wishes". These dies are compatible with most tabletop die cut machines. 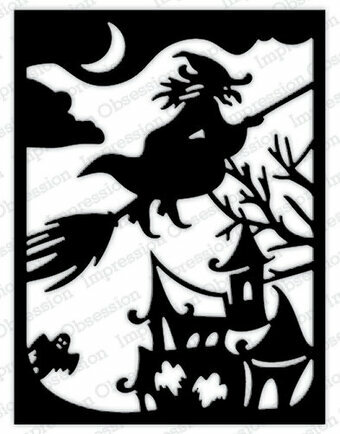 Halloween themed Impression Obsession craft die featuring a witch and a haunted house. This is a single die measuring approximately 3-3/4 x 5 inches. 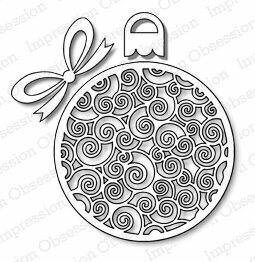 Craft die from Impression Obsession featuring a Christmas Tree. This is a set of 16 dies. The tree is approximately 2-3/4 x 3-7/8 inches. These are US-made steel dies compatible with most table-top die cutting machines. 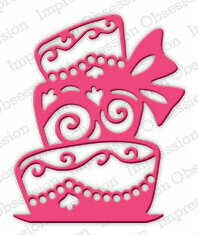 Love themed Impression Obsession die featuring a Hinged Heart. US-made steel die compatible with most table-top die cutting machines. This is a single die measuring approximately 1-5/8 x 1-5/8 inches. 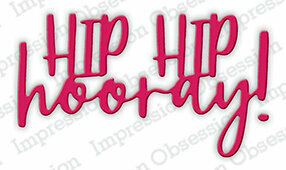 Impression Obsession craft die featuring the sentiment "Hip Hip Hooray". These are US-made steel dies compatible with most table-top die cutting machines. Christmas themed craft die from Impression Obsession featuring penguins and an igloo. This is a set of 12 dies. The igloo is approximately 2-1/2 x 4-3/8 inches and the penguins range from 3/4 to 1-1/4 inches. These are US-made steel dies compatible with most table-top die cutting machines. This is a set of 3 Christmas themed word edgers. These will cut the letter so that they stick UP from the top of the piece of paper or card you are using. The die measures 1/2" x 4-1/4" but you can use a straight-edge and a knife or other cutting device to extend the baseline as long as you want. These are US-made steel dies compatible with most table-top die cutting machines. Craft die from Impression Obsession featuring Christmas cookies. This is a set of 7 dies. The stars are 1-1/2 x 1-1/2 inch, the large gingerbread man is 1-3/4 x 2-1/4 inches, the tree is 2-1/8 x 2-1/2 inches, the bells are 1-1/2 x 1-3/4 inch, the small gingerbread man is 1-1/4 x 1-5/8 inch and the house is 1-7/8 x 1-7/8 inches. These are US-made steel dies compatible with most table-top die cutting machines. This is a set of 6 separate dies wired together, they can be separated by snipping the wires. The kite head measures 1.375 x 2 and the string measures around 3 inches long. These dies are compatible with most tabletop die cut machines. 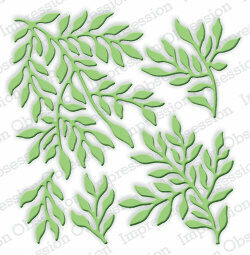 Features a background of leafy flourishes. This is a single die measuring 3-3/4 x 5 inches. Impression Obsession craft die featuring "Happy Easter". This is a single die measuring 2-5/8 x 3-1/2 inches. US-made steel die compatible with most table-top die cutting machines. Features a background of leafy vines. This is a single die measuring 3-3/4 x 5 inches. The branch measures 2" x 5-3/4". These dies are compatible with most tabletop die cut machines. Additional shims may be necessary and some machines handle the detail level better than others. Impression Obsession die featuring 2 birds and the word "Love". This die measures 1 x 3-3/4 inches. This is a set of 3 separate dies wired together, they can be separated by snipping the wires. The jar measures 1.5 inches and 2.5 inches. These dies are compatible with most tabletop die cut machines. This is a set of 2 dies. Miss measures 5/8 x 2-1/4 inches and You measures 1 x 1-7/8 inches. Features the sentiment "Miss You". These dies are compatible with most tabletop die cut machines. Craft die from Impression Obsession featuring many playful monkeys in the jungle. The circle measures 1" and the nest is 1" x 1-3/4". This die is compatible with most tabletop die cut machines. Additional shims may be necessary and some machines handle the detail level better than others. This is a set of two borders are 5-7/8" long. These dies are compatible with most tabletop die cut machines. Features an ornate flourish. This is a single die measuring 1-5/8 x 4-1/2 inches. These are US-made steel dies compatible with most table-top die cutting machines. This is a set of 16 dies that coordinate with a clear stamp set CL746. The cake top measures 1-5/8 inches, the cake measures 1-5/8 x 1-5/8 inches, and the large cake stand measures 1 x 1-3/4 inches. Featuring a star, balloon, heart, leaf, and flower. This is a set of 5 dies. Each element measures approximately 1-1/4 inch except the balloon which is 1-1/2 inches tall. Compatible with most table-top die cutting machines. An Autumn scene featuring several fall leaves and an acorn. This is a set of 5 dies. The longer leaves are around 2 inches long and 1 to 1-1/2 inches wide and the maple leaf is 1-1/2 x 1-1/2 inches. The acorn is 1 inch. 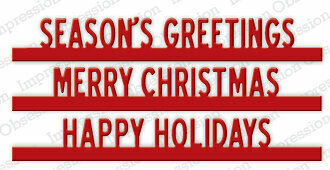 Craft die from Impression Obsession featuring the Christmas sentiment "Peace". This is a set of 6 dies. This is a set of 4 dies. The frame is approximately 3 x 3 inches, and the trees are approximately 3/4, 1, and 1-1/4 inches. These are US-made steel dies compatible with most table-top die cutting machines. Christmas themed craft die from Impression Obsession featuring penguins and a snowglobe. This is a set of 12 dies. This is a set of 3 dies. The snow globe is approximately 2-7/8 x 3-3/8 inches. These are US-made steel dies compatible with most table-top die cutting machines. This fence die measures 1 3/4" x 5 1/4". These are US-made steel dies compatible with most table-top die cutting machines. 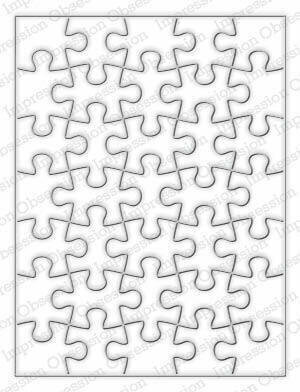 Features a background full of interlocking puzzle pieces. This is a single die measuring 3-3/4 x 5 inches.